Episode 9 of Shangri-la, “Sky Opening, Sun and Moon”, begins with Metal Age members noticing the solar eclipse, wondering if it would snow the next day and hoping that it won’t rain deadly hail. But they’re recalled to work by Takehiko, who is still working on the tunnel to rescue Kuniko. Little does he know that his scheme is now useless with Kuniko having escaped, not to mention that it would already have been too late if Kuniko had not used her own plan for escaping from the detention center. At the same time, Kuniko, Tomoka, and Momoko are flabbergasted by the encounter with a rather archaic gathering. It’s the whole procession accompanying Mikuni, of course, and Sayoko has been blasting any approaching cars during the whole time. While Mikuni and Miko are having a good time, Sayoko notices the presence of Momoko and others and tries to shoot them. Momoko realizes that they are being aimed for, and after getting Kuniko and Tomoka under cover, decides to have fun with the attackers. Momoko proves that her whip is bulletproof as it is used to block the shots by the bodyguards. For that matter, blocking the bullets with the whip must mean Momoko is also more than human: the earring implied that Momoko was related to Mikuni somehow, but maybe there’s something special about Momoko’s origins as well. Kuniko decides that she should help: helping the unknown attackers, that is. She’s quite confident about Momoko’s fighting abilities and is more worried about Momoko getting carried away with the attackers, so she tries to get the fight to end by attacking a carriage in the background with her boomerang. Mikuni and Miko are in the carriage, and Miko, who doesn’t seem to know more than that “enemies” have been approaching and are now attacking, decides to get out of the carriage to repel any incoming attackers. Miko manages to repel Kuniko’s next boomerang throw, although the shock is too much such that Miko drops unconscious. Miko does recognize the boomerang before blacking out. And given how Miko was not cut in half, this seems to confirm that the boomerang indeed blunts itself when encountering flesh. Sayoko is seemingly distracted by the attack on the carriage, which Momoko uses to knock her down, but it was actually a chance for Sayoko to inject Momoko with a paralyzing agent. Before Kuniko can help Momoko, however, a helicopter approaches and drops really old-fashioned gates that block Kuniko’s way, and the helicopter retrieves everything, Mikuni, Miko, the attendants, the captured Momoko, etc. right before the solar eclipse ends. It seems the Moon Palace really has a pathological need to do everything with style. Mikuni never had the chance to see who the “attackers” were, and she definitely did not have the chance to notice Momoko’s earring. 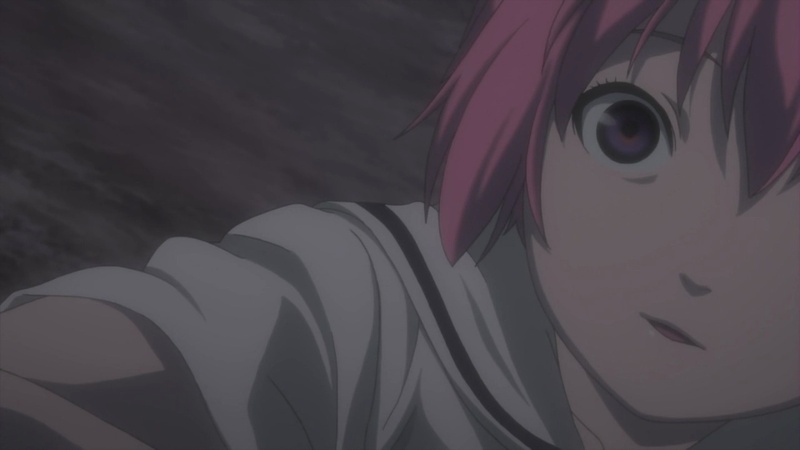 Tomoka had also been hurt during the fight from a stray bullet. At least Kuniko did get a glimpse of Mikuni, even if she has no idea who she is. In ATLAS, Ryouko hears about what had happened and doesn’t mind Sayoko having obtained a new human subject to experiment upon as long as Sayoko doesn’t go too far. I do have to wonder what would constitute “going too far” … Ryouko notes that she would have to report what happened to Hiruko, but when she gets mail, she has all of her subordinates leave the room. It looks like Ryouko has a secret source of intelligence: I wonder if it’s anyone we already know? Meanwhile, Karin gets a collect phone call from Frankfurt. It is Klaris, who has barely managed to find a payphone and complains about being so poor that she has to use food stamps. Klaris seems to have an odd standard for being poor, as Karin’s offer to transfer 3 million only solicits a complaint that it would barely cover lunch (even Karin wonders what sort of lunch it is). So Karin offers to transfer 30 million instead. In return, Karin wants Klaris to do something, which I guess is related to getting Medusa’s attention back to this planet. 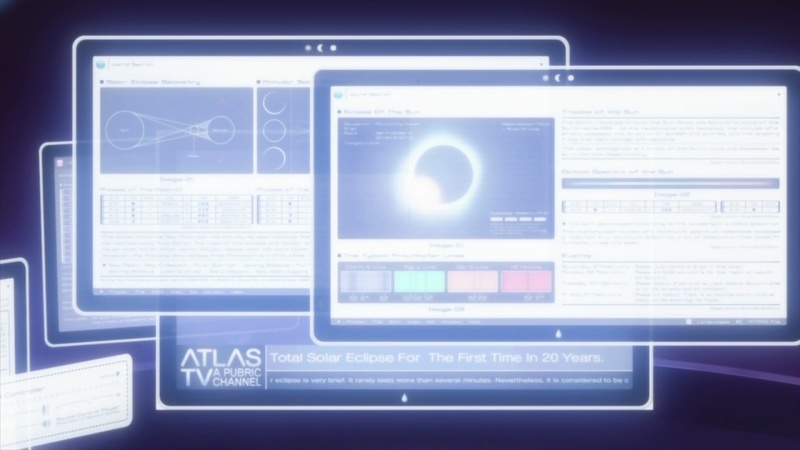 Incidentally, a small news item on Karin’s screen mentions that this is the first total solar eclipse in twenty years. Back in ATLAS, Ryouko notices MEDUSA being mentioned while she reads the mail in private. Within the heart of ATLAS, Ryouko reports to Hiruko the encounter between the Sun and the Moon. It’s mentioned that this was prophesied by the Hiruko from twelve generations before. Hiruko says that Kuniko and Mikuni are the Sun and Moon which will become their light, that they are the children of god who will bring about harmony. Having said this, Hiruko disintegrates. Ryouko mentions that this Hiruko lasted relatively long at seven years, and has a replacement vessel brought in before Hiruko’s spirit escapes. The replacement vessel is a hapless girl who is thrown into the pool previously containing Hiruko, and she is quickly possessed by Hiruko as she screams. At Ishida Finance, Klaris reports to Karin that while Medusa is refusing Karin’s commands, it doesn’t look like there is bug with Medusa itself as it accepts forced termination commands. But before Karin can prod Klaris further, Klaris mentions that she had already spent her 30 million on lunch and dessert without even having gotten her own computer back, and we hear her disconnect while apologizing to someone for using their computer for too long. (What is Klaris really spending all her money on?) This is an aggravating situation for Karin, since she’s losing the chance to earn a lot of money given the high market carbon levels for America (5.20), China (5.25), and Russia (2.61). At the same time, ATLAS members Kudo and Soichiro notices the carbon levels for Russia (2.61), India (1.44), and Canada (1.23) and wonder why Medusa is not being drawn out, after being informed about its existence by Ryouko. By now Kuniko and Tomoka have returned to Duomo, and the townsfolk happily greet the overly cheery Kuniko. While Kuniko’s first place to stop by in Duomo is her home with her grandmother, she doesn’t stay long. She must have heard about Takehiko’s efforts to rescue her, so instead she heads to the tunnel that Metal Age is digging to rescue her. Of course, Takehiko and others are surprised to see the person they’re trying to rescue urging them on, but Kuniko intends to rescue her friends at the detention center and embarrass Ryouko. Elsewhere, Kunihito arrives at a ship in a shipyard, apparently on official military business. Meanwhile, Klaris has discovered what was wrong with Medusa. She found out that Tarsian had somehow increased his command priority over Karin’s and had set Medusa on a Jupiter observation spacecraft. At that moment, Medusa starts talking and tells Karin that it would overcome its weakness. At the same time within the heart of ATLAS, Hiruko has now completely possessed the hapless girl from earlier. When Ryouko asks for directions, Hiruko reveals a prophesy: “On the day the sun and moon mingled, a heir appeared. Soon heaven and earth will sink.” When Ryouko asks who receives heaven’s will: “The heir will naturally learn the role of ATLAS. Simply watch for now.” And Hiruko warns that they should prepare for the coming storm. Karin also notices Medusa accessing the solar power satellite Apollon, which begins to reorient itself and fires a beam of searing light into the sea. It looks like it is literally causing the storm that Hiruko is warning about. Meanwhile, Kuniko and Metal Age has finally managed to dig through to the detention center: I’m impressed that Takehiko’s hare-brained scheme could have actually worked within a reasonable amount of time. However, they only find the detention center abandoned with the bodies of the dead girls left behind, and Kuniko learns what happend to them much sooner than I would have thought. If my theory about the weather being influenced by Kuniko’s mood is true, what follows next is not going to be pretty, especially with what is happening with the Apollon. Even though I have no idea what Hiruko really is, it seems that Hiruko really is calling the shots in ATLAS, and that Ryouko wasn’t being sarcastic when she called Hiruko the top administrator of ATLAS at the end of episode 2. From the dialogue in this episode, it looks like my theory that Kuniko et al. are supposed to replace Hiruko et al. is just wrong. Rather, it looks like Hiruko has been planning a long time to bring about Kuniko et al. to achieve harmony in this world, with Ryouko working to implement the plan. Of course, harmony for Hiruko might mean something pretty different for the average person … I now again have no idea what role Kuniko, Mikuni, and Kunihito are supposed to play in the schemes of ATLAS. Ryouko wasn’t being sarcastic when she called Hiruko the top administrator of ATLAS at the end of episode 2. Well, I hope they explain more about the Hiruko already. It just keeps on saying prophecies and the anime is still not revealing to us who exactly he/she/it is referring to. Gah . . .
I’m beginning to think that Kuniko’s boomerang, and Mikuni and Kunihito’s swords have the Hiruko’s power or something. They might have something to do with the harmony. Ugghh . . I dunno. the mystery in this series is driving me crazy . . . in a good way. Haha! Gaaahh . . . no . . . I hope they won’t torment us for THAT long X_X that’s so many episodes to go. My brain might not be able to handle it. Haha! I hope next episode will reveal/explain the harmony part. Ah, by the way, thanks for the linkage ^_^ I love your blog too, hope you don’t mind if I add this site in our partners list (aka blogroll) hehe!